When we last left off, Muten Roshi was being summoned to the Gyu-Mao's castle in order to put out the large fire that has been consuming Fry-pan Mountain for ages. Or something like that. Generally, these stories sound cooler when you say "for ages." Actually, Muten Roshi was actually being called upon by Son Goku and the Gyu-Mao so that they could use his Basho-sen to put out the fire. However, the Basho-sen had been thrown away because the great Kame-sen'nin accidentally spilled Wonton Soup on it while using it as a potholder. I understand because I often do the same with my mystical powered fans. Nobody's perfect. The second volume of the ever-popular and classic Dragon Ball manga introduces us to the much loved Kamehameha technique that I'm sure many people have tried to perform while cosplaying. It is the technique that Muten Roshi uses to put out the fire on Fry-pan Mountain... as well as to accidentally destroy Fry-pan Mountain in the process. Didn't I say nobody was perfect? 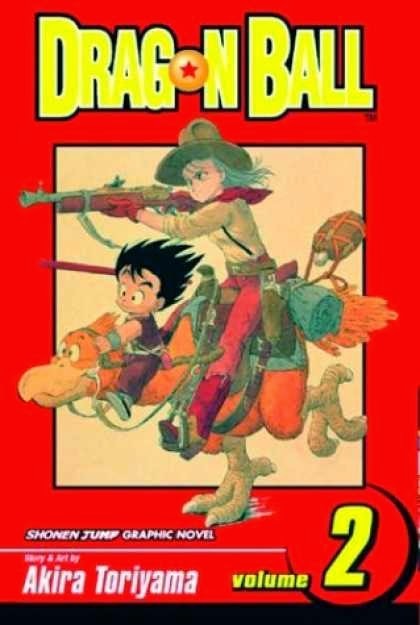 In this volume we also meet Emperor Pilaf and the famed eternal dragon Shenlong for the first time. Unlike in the anime, Emperor Pilaf isn't featured nearly as heavily. I never thought he was that much of an interesting villain to begin with, but I thought it was funny how he was quick to break fourth walls and mention Toriyama's previous manga Dr. Slump. Shenlong himself isn't much of a character, but he was always meant to be more of an intimidating and mystical image than an actual character anyway. Perhaps the most important thing in this volume is Son Goku's transformation into the Oozaru form. While you don't know why he transforms into a Giant Ape-like form when it's a full moon night, it's no stretch of the imagination that it's an obvious allusion to Journey to the West. Of course, Toriyama would include his own interesting take on the reasons for Goku's transformation later on in the series. This volume ends with Yamcha and Bulma becoming a couple and Son Goku seeking out Muten Roshi one more time so that he can train under him.